Repetitive lifting and, to a lesser extent, overhead reaching can lead to inflammation, microtearing, and, if the condition goes untreated, degenerative changes. 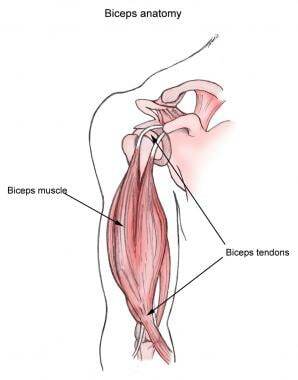 Patients with bicipital tendinitis typically report anterior shoulder or humeral pain aggravated by lifting or overhead reaching. The patient often takes one finger and points directly to the bicipital groove when describing the pain. Patients may not be able to flex at the elbow against resistance because of the pain of active tendinitis. Anesthetic block may be necessary to distinguish the pain from the referred pain of rotator cuff pathology. The diagnosis is mostly clinical and specialized radiographic testing is rarely necessary. Local corticosteroid injection may be used to relieve symptoms in patients with symptoms that persist for more than 4 weeks despite conservative treatment. Long-term outcome, however, is much the same for patients who undergo joint injection to treat bicipital tendinitis as for those who do not. Physical therapy is helpful for most of these patients. Bicipital groove injection, the most precise anatomic injection, is recommended in patients younger than 50 years. The risk of tendon rupture is greater in patients aged 50 years and older. A subacromial injection is preferred in this population because it avoids direct needle penetration of the tendon. Corticosteroid joint injection can speed up recovery from bicipital tendinitis in high-performance athletes, but this is a controversial indication. Few absolute contraindications exist for joint or soft-tissue aspirations and injections. The procedures should probably be avoided if the overlying skin or subcutaneous tissues are infected or if bacteremia is suspected. The presence of a significant bleeding disorder, diathesis, or severe thrombocytopenia may also preclude joint aspiration. Aspiration of a joint with a prosthesis carries a particularly high risk of infection and is often best left to surgeons using full aseptic techniques. If infection is suspected as the underlying cause of the musculoskeletal problem, corticosteroids must not be injected, because they may exacerbate the infection. Warfarin anticoagulation with international normalization ratio (INR) values in the therapeutic range is not a contraindication for joint or soft-tissue aspiration or injection. Zayat AS, Buch M, Wakefield RJ. Arthrocentesis and injection of joints and soft tissues. Firestein GS, Budd RC, Gabriel SE, MacInnes IB, O'Dell JR, eds. Kelley and Firestein's Textbook of Rheumatology. 10th ed. Philadelphia: Elsevier; 2017. Vol 1: 802-16. Ahrens PM, Boileau P. The long head of biceps and associated tendinopathy. J Bone Joint Surg Br. 2007 Aug. 89 (8):1001-9. [Medline]. Burton JH, Fortuna TJ. Joints and bursae. Tintinalli JE, Stapczynski JS, Ma OJ, Yealy D, Meckler GD, Cline DM, eds. Tintinalli's Emergency Medicine: A Comprehensive Study Guide. 8th ed. New York: McGraw-Hill; 2016. 1927-35. Tallia AF, Cardone DA. Diagnostic and therapeutic injection of the shoulder region. Am Fam Physician. 2003 Mar 15. 67 (6):1271-8. [Medline]. [Full Text]. Messina C, Banfi G, Orlandi D, Lacelli F, Serafini G, Mauri G, et al. Ultrasound-guided interventional procedures around the shoulder. Br J Radiol. 2016. 89 (1057):20150372. [Medline]. Lee SW, Tiu T, Roberts J, Lee B, Bartels MN, Oh-Park M. Point-of-Care Ultrasonography Findings and Care Use Among Patients Undergoing Ultrasound-Guided Shoulder Injections. Am J Phys Med Rehabil. 2018 Jan. 97 (1):56-61. [Medline]. Daniels EW, Cole D, Jacobs B, Phillips SF. Existing Evidence on Ultrasound-Guided Injections in Sports Medicine. Orthop J Sports Med. 2018 Feb. 6 (2):2325967118756576. [Medline]. Mitra R, Nguyen A, Stevens KJ. Fluoroscopically guided supraglenoid tubercle steroid injections for the management of biceps tendonitis. Pain Pract. 2011 Jul-Aug. 11 (4):392-6. [Medline]. Petscavage-Thomas J, Gustas C. Comparison of Ultrasound-Guided to Fluoroscopy-Guided Biceps Tendon Sheath Therapeutic Injection. J Ultrasound Med. 2016 Oct. 35 (10):2217-21. [Medline]. Dickson J. Shoulder injections in primary care. Practitioner. 2000 Mar. 244 (1608):259-65. [Medline].